Lake Buena Vista, Fla. (August 7, 2015) – This week, Disney began sales of Four Seasons Private Residences Orlando at Walt Disney World Resort, the most recent phase of development in the luxury resort-residential community of Golden Oak. Nestled within Golden Oak and offering private entry to Four Seasons Resort Orlando, these single-family custom homes will feel like an extension of the Resort with amenities just steps away. New to the Central Florida market, these unique residences will offer a luxury lifestyle featuring personalized service delivered by Four Seasons. In addition to the benefits and amenities that come from living at Golden Oak, owners of Four Seasons Private Residences will also have a private entry and access to the amenities and services at the neighboring Four Seasons Resort Orlando, which includes a full-service spa, five pool areas, tennis courts and six onsite restaurants. The Resort will also offer these homeowners in-home á la carte services such as spa treatments, residential cleaning and in residence dining and catering for parties. Residents will also have á la carte access to the Kids for All Seasons program for an additional fee. All services and amenities available through Four Seasons Resort Orlando will be overseen by a dedicated Residence Manager. "Homeowners at Golden Oak have the rare opportunity to create unforgettable memories with family and friends for generations to come," said Page Pierce, vice president of Disney Resort Real Estate Development. "Located within the community of Golden Oak, Four Seasons Private Residences Orlando at Walt Disney World Resort combines two brands renowned for impeccable service, outstanding amenities and exceptional experiences: Walt Disney World Resort and Four Seasons Hotels and Resorts." 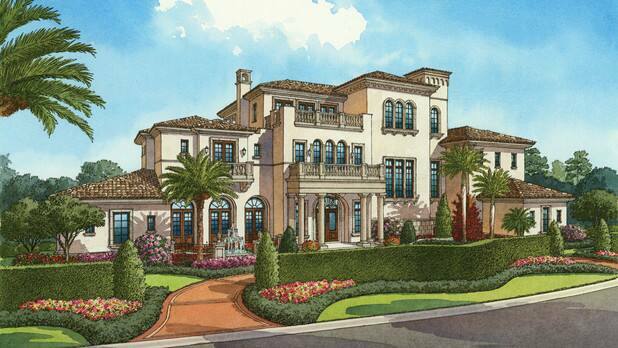 Four Seasons Private Residences Orlando will include three collections of approximately one-half acre homesites. These custom residences, ranging in size from 6,000 to over 10,000 square feet, will feature three European-inspired styles embodying Venetian, Italianate and Spanish Revival architectural precedents. Homeowners will also have the option to include a Four Seasons butler pantry allowing in-home deliveries of everything from groceries to linens, while not permitting staff access to the primary residence. The Edgewood collection features four European-style homes placed among a wooded preserve, while Starview will boast six grand residences with serene privacy situated on homesites with terraced backyards. With the options of golf course views, water views or the natural Florida surroundings, Starview homes will allow residents to savor the finest in indoor-outdoor living. The balance of the homesites, known as Gardenside, will feature lush landscapes. The majority of the homes will include views of natural preserves and green spaces, while two unique corner homesites will be placed for residences with private interior courtyards, blending Old World style with outdoor living. Like all Golden Oak residents, owners of Four Seasons Private Residences will be members of the Golden Oak Club. As members of the Club owners will have access to other amenities including Summerhouse, the private community clubhouse featuring the full-service Markham's dining room and Tyler's Lounge and concierge-style Resident Services which organizes a variety of engaging activities and events throughout the year, including seasonal parties and private theme park events, as well as, park transportation, golf services, and more. The Golden Oak community offers the only current opportunity for families to own homes at Walt Disney World Resort. The community welcomed its first residents in 2012 and Four Seasons Resort Orlando opened in August 2014. Four Seasons Private Residences* prices start at $5 million and construction is anticipated to begin later this summer. For more information about Four Seasons Private Residences Orlando at Walt Disney World Resort, visit www.orlandoprivateresidences.com or call Golden Oak Realty at (407) 939-5577. *Reflects current development plans, which are subject to change without notice. Ancillary amenities privileges and services charged separately. Golden Oak brings together family, friends, and cherished Disney traditions in a unique, luxury residential resort community of single-family custom homes with prices starting at $2 million. To live at Golden Oak is to enjoy a year-round resort lifestyle that includes distinctive neighborhoods, expansive nature preserves, and an unsurpassed array of amenities and concierge-style resident services. The community's resort and recreation options include a private clubhouse, Four Seasons Private Residences and Four Seasons Resort Orlando at Walt Disney World Resort. Golden Oak offers a refined interpretation of resort living. Home sites are carefully placed to maximize privacy and landscape views, while home designs reflect the character and presence of century-old dwellings. Once fully developed, Golden Oak is anticipated to include approximately 285 homes and encompass 980 acres. Founded in 1960, Four Seasons continues to define the future of luxury hospitality with extraordinary imagination, unwavering commitment to the highest standards of quality, and the most genuine and customized service. Currently operating 93 hotels and residences in major city centers and resort destinations in 39 countries, and with more than 60 projects in development, Four Seasons consistently ranks among the world's best hotels and most prestigious brands in reader polls, traveler reviews and industry awards. For more information, visit fourseasons.com. For the latest news visit press.fourseasons.com and follow @FourSeasonsPR on Twitter.